If you’re a freelance web designer or developer, there’s no doubt that many of your projects will be constructed using WordPress. And if you’re an experienced WordPress user, you know that well-built plugins can make life much easier for you, while also giving your client an easy way to manage their website without having to call you in order to make small changes. Being a full-time freelance web designer myself, I would like to share with you some my favorite WordPress plugins. I chose these plugins based on how easy it is to setup each plugin, and more importantly, its ability to get the job done in most practical situations. Based on the fact that this plugin is one of the most downloaded from WordPress.org, it’s hard to deny that it gets the job done. The All-In-One SEO Pack Plugin allows you complete control over all aspects of search engine optimization for your website. The settings panel is extremely user-friendly and the plugin gives you full control without going over-board with confusing options. In my opinion, the plugin’s easy-to-use setting panel is a nice feature when considering other WordPress plugins that try and provide too many options. 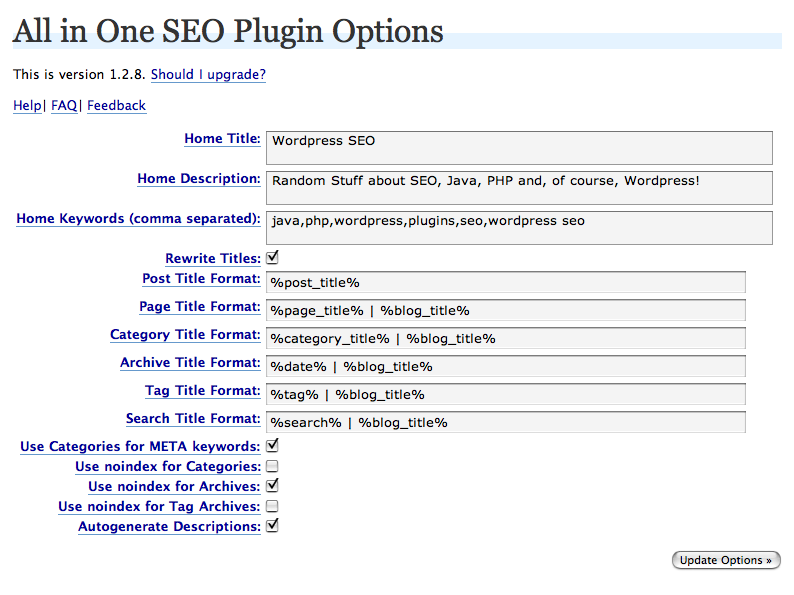 In almost all of my website projects I use the All-In-One SEO Pack Plugin. In it’s original release, Slideck had a nice user-friendly interface for managing a slider, but that version did not include some of the standard features that users expected to see with the slider. But the creators were smart enough to listen and they upgraded the plugin to a much higher level of performance and curb appeal. They named it Slidedeck 2. Slidedeck 2 not only contains 2 default slider themes, but it contains an extremely easy-to-use (and very graphical) settings menu that allows you to setup your new slider options in a very specific way. You can also upgrade to the Pro version for a fee. Slideck 2 can be placed anywhere on your website. You are able to place the slider on your posts or pages by using short codes that are programmed into the plugin itself. Or to place the slider in your page template files, you can simply copy and paste a PHP code snippet that is automatically generated by the plugin. This is great because there’s only one step required to get the slider into your website. And there’s more! The Slidedeck team also provides limited free support for the plugin, which means that you only need to create a user account inside of their support forum, then you can immediately ask a question. Within 24 hours you will likely receive a response to your problem. The Slidedeck 2 Plugin is my plugin of choice for all of my slider functionality. When my website projects require having a sign up form triggered by a button, I usually prefer it to open up inside of a lightbox, which adds more visual appeal. To do this, I use the Form Lightbox Plugin. Through the use of shortcodes, this plugin allows you to add your form, images, or video to your website in minutes. There are a few different design choices when it comes to customizing the look of your lightbox, and all the options are on one easy-to-understand settings page. You can adjust basic settings like the speed of the lightbox, or decide if the lightbox opens immediately when the web page finishes loading. And furthermore, if you need the lightbox to display on specific pages, you can also do that directly through the Menu settings panel inside of the WordPress Dashboard. There are many lightbox plugins out there, although the Form Lightbox Plugin was the easiest to use and got the job done nicely. Do you like your blog post images, gallery or portfolio images to open up in a lightbox, or even your Youtube or Vimeo videos? If you’re looking to spice up your images or other media, prettyPhoto Media is a great WordPress Plugin. Using the plugin is extremely easy. All you need to do is add rel="prettyPhoto" to your image or videos and your set to go! Check your website immediately to see your website images come to life inside of a lightbox. There’s not much more to explain about his plugin – just go and download the Plugin here and try it for yourself! Does your website have a lot of images that are slowing down the load time of your web pages? Or if your website runs normal, would you like to boost it’s performance to an even higher level? WP Super Cache is a great plugin to use if so. When you first use WP Cache, you might be a little intimidated by the settings offered with this plugin. However, you will notice that each specific setting throughout the Plugin tells you which options are recommended. If you’re new to this plugin, go ahead and just navigate through each of the settings on each page and choose all of the settings that have “(recommended)” next to them. Then go back to the 1st page and activate the plugin through it’s own settings panel. Then click on “Test Cache” below that to see if the plugin is working correctly with your website being cached – then that’s it! Check your website and after browsing 3 or 4 pages, you will notice immediately that your website loads faster (in my experience). How does WP Super Cache work? The plugin simply stores all of your database information in it’s own files, then it generates a new custom HTML webpage that gets displayed to your website visitors. This works great because the plugin will automatically check for any webpage updates on a time frame that you designate. However, until the plugin updates it’s files, your website visitors will see only the “cached” version of your web pages. This reduces load time tremendously for the users viewing your website. And let’s not forget that Google also places websites that load faster into a higher search rank compared to those slower-loading websites. Please feel free to share your comments and tell the world which plugins you like to use. There are so many Plugins popping up everyday that us designers and developers have a need to know what’s out there!